This is no revelation. I’m almost thankful that food has, for the most part, been eliminated from planes due to budget cuts. It sucked anyways. So thank you airlines for no longer leading me to believe that I’m going to be ‘fed’ during my travels. Recently, I was pleasantly surprised. On a flight from Miami to Lima, we were served a delicious soup of fire-roasted eggplant and tomato that was leaps and bounds from gruel. Not only was it flavorful and full of chunks of eggplant and tomato, it was spicy. Good heat always gets major points in my book. We licked our bowls clean, inspiring me to make my own version on solid ground. 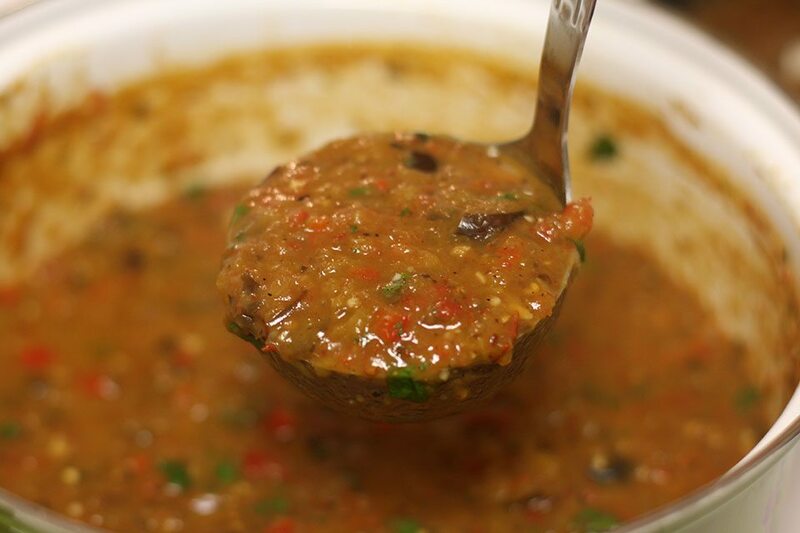 Tender Japanese eggplants, sweet heirloom tomates and red bell pepper are first charred on the grill then thrown into a soup pot with red onion, loads of garlic and stock. Chipotles in adobo are added for a swift kick in the seat. 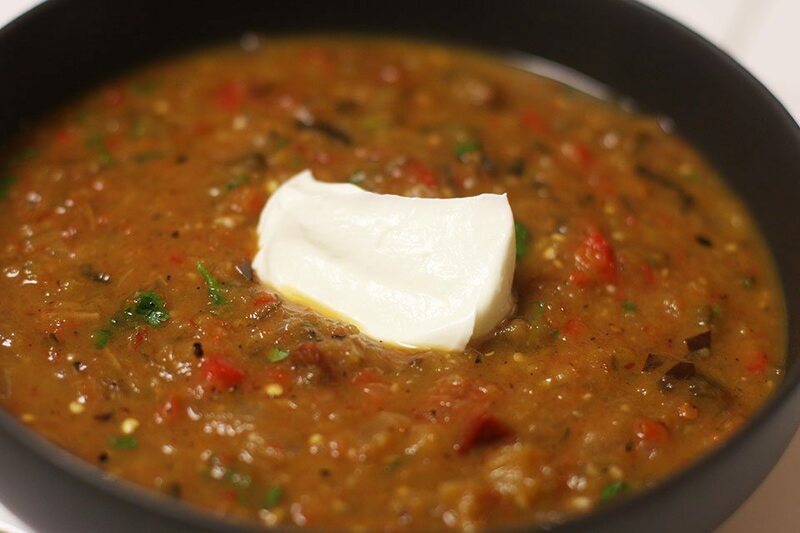 Fresh cilantro is swirled in at the end to brighten up this hearty soup, and it’s all topped off with sour cream to balance that chipotle heat. I was happy to learn that the dish we had was created by Stephen Pyles, a fabulous chef, fellow Texan and one of the founding fathers of Southwestern cuisine. So, many thanks, Stephen, for preventing mile-high starvation with such a divine concoction. Much appreciated. Preheat the grill, or grill pan, to medium-high heat. Grill tomatoes until charred on both sides, about 4m each side. Grill the eggplants until they are browned and soft on all sides. 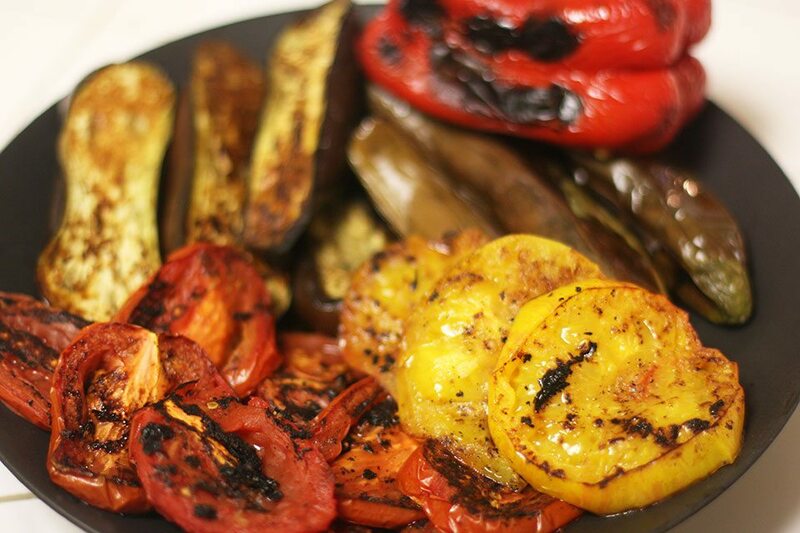 Grill the bell pepper until blackened on all sides and the skin has loosened. Let the veggies cool until you can handle them comfortably. Remove the skin, stem and seeds from the red bell pepper. Chop up the eggplant, bell pepper and tomatoes into an approximately 1/2″ dice. Heat the olive oil in a large soup pot over medium heat. Add in the red onion and cook until translucent, about 5-7m. Add in the garlic and chipotles, and cook for 2m. Add in the roasted vegetables, chicken stock, salt and pepper. Bring to a boil, then let simmer on medium-low heat for 10m. Remove the soup from the heat. Now, we are going to puree some of the soup, but not all to maintain the texture of the vegetables. For those with an immersion blender, blend in pulses slowly moving around the pot. Don’t blend for more than 2 seconds at a time. Do this until half the soup is pureed, and the soup has a consistency of a thick salsa. For those with a blender or food processor, blend (also in pulses) half the soup in batches and add back to the pot. Stir in the chopped cilantro. Ladle into bowls and top with a dollop of sour cream, the fattening kind. I recommend using roma or heirloom tomatoes because they have less seeds, less juice and more meat, which means they are ideal for grilling.